Nostalgic for the feel, smell, and look of comic books printed on Newsprint paper? Even more nostalgic for old school comic book prices? You’re not alone. Alterna Comics is trying some new ideas, including the OLD idea of Newsprint. That’s right, Alterna is planning a line of Newsprint comics, with 1st Black & White issues costing $1, and subsequent issues costing $1.50. Color Newsprint books will have a first issue price of $1.50, with subsequent issues cover priced at $1.99. The line will be comprised of bi-monthly, quaterly and one-shot titles, due to start in Spring/Summer of 2017. This will be interesting to watch, not just for the quality of the books printed this way, but to see how much of an effect this has on garnering new sales/readers. In a market flooded with titles by larger companies, smaller companies are often overlooked, even when the books are critically acclaimed or just appear interesting, because of cost. Especially when you consider that smaller companies often pay more than the mass produced competition from larger companies, who get better deals on their printing and distribution costs due to their high volume. This can level the playing field, and done right, give a smaller company an advantage in the new reader market. For more info, and their new logo designs, check out the press release below. New Year. New Logo. Newsprint. For 10 years, Alterna Comics has produced over 50 different graphic novels for distribution in comic shops and bookstores. Now entering their 11th year, Alterna is announcing plans for a single issue lineup that will feature throwback style covers, a new logo, prices under $1.99 an issue, and the distant but familiar feel of newsprint. Alterna is a creator-owned company with an open door submissions policy. Known for producing the FUBAR series, THE CHAIR (which has been adapted to a film that stars the late Roddy Piper), the IF anthology, NOVO, LILITH DARK, MOTHER RUSSIA, CROAK, and many more. Alterna’s lineup has been an eclectic one over the past ten years. ABOUT ALTERNA COMICS: Founded in 2006 by current president and publisher Peter Simeti, Alterna Comics titles are distributed worldwide in print and digital formats and in several languages. 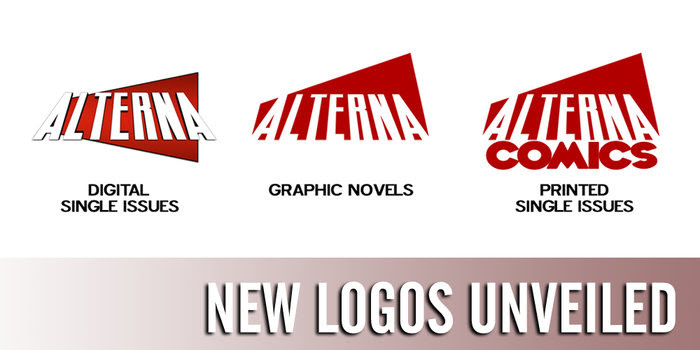 A creator-owned comic book publisher, Alterna creators own the licensing and merchandising rights to their creations. Alterna Comics titles are distributed to the comic market by Diamond Comics Distributors and to the book and ebook market by IPG (Independent Publishers Group). Digital comics can also be found on comiXology. Alterna Comics titles are found wherever graphic novels are sold. For more information, visit www.alternacomics.com. Sebastian Piccione has had a lifelong love of comics. He holds an AA in Fine Art, as well as a BS and MS in English Literature. A native New Yorker, he currently resides on Florida’s Space Coast where he teaches High School English and writes comic books for his self publishing company SUNDAY KNIGHT COMICS.